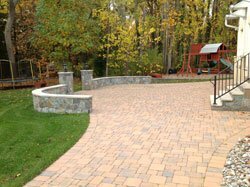 Find out how Nicolock patio pavers can transform the way people look at your Bel Air, Maryland home or business. With an average ROI over 80%, according to Remodeling Magazine’s annual Cost vs. Value report, a new patio is an excellent investment. But before you going jumping at the opportunity to build your own barbeque oasis, it is important to do a little research. There are tons of patio options out there: stamped concrete, poured concrete, and of course pavers. And even when you choose one of those options, guess what? There are still more options. There are more paver manufacturers than you could shake a stick at (not sure why you would, but you never know). Paver-Shield Pavers: Made using Nicolock’s patented Paver-Shield™ technology, these patio pavers will continue to look great long after they have been installed. Paving Slabs: Nicolock paving slabs are attractive and cost effective. That’s what we like to call a win-win. Toscana Antiqued Pavers: These pavers combine the look of naturally aged stone with the durability of high-strength concrete. That’s another win-win in our books. Environmental Pavers: Nicolock manufactures several variations of eco-friendly permeable paving products. Richer, vibrant color that will not fade over time. A smooth ultra-dense surface that will not wear. Stand up to harsh de-icing salts, making them perfect for commercial use. With 40 years in the home improvement industry, Freedom Fence and Home has earned a reputation for high quality work and even higher quality customer service at an affordable rate. Our hardscape experts are ready to help homeowners and business owners in Bel Air design a new patio that will have passersby noticing your home or business. Click Here to view our patio gallery. This entry was posted on Tuesday, March 31st, 2015	at 6:24 pm	. Both comments and pings are currently closed.